Discuss issues/problems, not individuals: Keep discussion of difficult issues focused on the issues/problems, not the people involved. Do not name individuals in a way that is negative, harmful, or defamatory. Please use names, though, when sending or thank-you or a kudo! Follow the Washington Post Rule: Remember a blog is a public communication, not a private conversation. Do not put anything in a post that you would not be comfortable seeing - with your name attached - on the pages of the Washington Post. Avoid speculation: Avoid posting messages that pass on information that might not be true or might only be partially true. Follow the golden rule: Treat other people the same way you would want them to treat you. Please disagree in a friendly and respectful manner. Be careful with humor and sarcasm: Tone of voice rarely translates in an email, post of forum message. Reread your message before posting: Rereading your message before you post it may help you spot missing words or other things that may be confusing. for continuing membership in the Eisenhower Partnership. 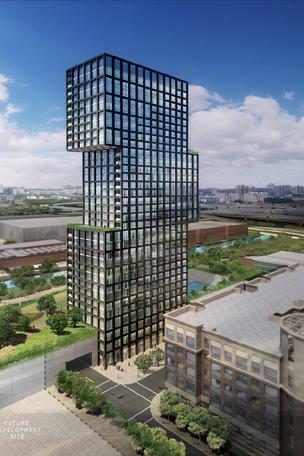 The 382-unit Carlyle Plaza Two by JM Zell and Hines Interests has been working its way through the City’s design review processes. Once the bold architecture is approved, the building will be cleared for the building permit and construction phase, as it already has development approvals as part of a broader Development Special Use Permit. We are keeping our fingers crossed for a 2016 groundbreaking! l help speed the changes forecast and enabled by the Eisenhower West Small Area Plan adopted by City Council in 2015 and the Landmark Van Dorn plan adopted several years ago. The group’s first meeting is scheduled for September. Welcome to new and renewing members! The Washington Business Journal focused on Alexandria in its “On the Road” series June 23. A panel including Stephanie Landrum (Alexandria Economic Development Partnership), John Taylor Chapman (Alexandria City Council) and Jeff Zell (JM Zell Partners) discussed some of the new projects on Eisenhower Avenue. With regard to the National Science Foundation (NSF), Councilman John Chapman noted that the City Council wants to be competitive when it comes to landing projects that could be catalysts to neighborhood redevelopment. NSF will move in to its new building in late summer 2017. Stephanie Landrum was optimistic that Alexandria will win the rebid for the Transportation Security Administration (TSA). She also mentioned a number of investors who are buying portions of the Hoffman family holdings: USAA, Lowe, Perseus, Rubinstein, and Wright Investment are some of the names cited. Jeff Zell focused on his belief that the Carlyle Plaza Two site near Holland Lane warranted an iconic landmark building with architecture that is distinctive amidst Alexandria’s trademark brick buildings. Overall, the climate for redevelopment of Eisenhower Avenue is very positive, and new investment is poised to create a new dynamism along the Avenue. Click here for full Washington Business Journal article. The new owners of 2000-2034 Eisenhower Avenue held an ice cream social on June 23 for the tenants and friends of the property between Mill Road and Hooffs Run Drive. The Hoffman family previously owned the 13.5 acre site across from the PTO. Current tenants include OneLife fitness and several restaurants including Foster’s Grille, Zikrayet, Sumo Japanese Sushi Bar Steakhouse &Hibachi, Paisano’s, and Hunan Café. The building is located directly east of the Eisenhower Metro Station, with an official address of 750 Port Street. It offers studio, and 1-, 2-, or 3-bedroom apartments. Unit finishes include NEST thermostats, stainless steel appliances, granite countertops, and dark laminate flooring in the main living areas. The building offers concierge services, a state-of-the-art fitness center, rooftop lounge with fireplace, rooftop outdoor swimming pool, onsite dog grooming station, sculpture garden, cyber lounge with Mac computers, and underground parking. For further information, contact the leasing office at 703-567-6003 or consult the building’s website at www.parcmeridian.com. There once was a site known as the Lehigh site, then the VDOT site…and now it has been acquired by Rushmark, which received City of Alexandria approvals in February to build two high rise buildings with 533 apartments and 67 townhouses on the 9 acres. The townhouses are to be built by Toll Brothers as sales units, while the multi-family units will be rentals. The site’s location immediately adjacent to the Metro Storage and Inspection Yards has required careful site layout and screening techniques to shield residents from the noise of Metro trains circulating nearby; Rushmark is solving the flood zone issues by raising the level of the land by 7 to 8 feet. Rushmark plans to start ground work in September. The townhouses will deliver first. After an April 2017 groundbreaking and 2-2.5 years of construction the rear apartment building will follow, and the project will close out with the apartment tower closest to Eisenhower Avenue. The final building contains 9,000 square feet of retail space, whose use has not yet been determined. The buildings are designed to look striking, using rich saturated colors in precast materials. To accommodate the close to 800 new residents projected on the site, Rushmark will install a traffic signal at the intersection, and provide two total entrances to the property. Among the public benefits cited for the project are 21 “affordable” housing units committed for 40 years plus a contribution of $2.2 million to the City’s Housing Trust Fund for affordable units off-site; a $215,000 contribution to public art, and a $60,000 contribution to a bikeshare station. christopher consultants, ltd. (christopher) was founded in 1982 and is a full service civil engineering, land planning, surveying and landscape architecture firm headquartered in Fairfax, Virginia and serving the Washington DC metropolitan region. In their 34 year history, christopher has worked on over 350 projects in and for the City of Alexandria, including Potomac Yard, the Hoffman Town Center and the Alexandria Waterfront.